Description: A “STILL LIFE” IN THE TRUE SENSE OF THE WORD! This painting was painted in the studio from slides taken at Cheverny in the Loire Valley. Rather than visit another chateau, my husband and I went to see the hounds, who were not very energetic. 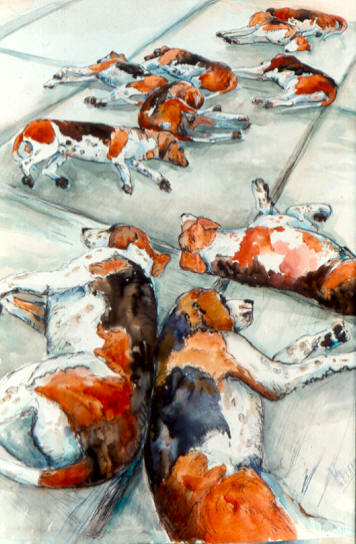 This painting was accepted into the 2000 Biannual Watercolor show at the Triton Museum, Santa Clara, CA.